Do you see coloured auras? Seeing the energy field of any human being is the equivalent of interpreting their holographic blueprint or biofield. I recommend reading the information about the Human Biofield in conjunction with this page. The biofield can be read, scanned and interpreted in many different ways, just like any blueprint. It's all dependant on the abilities of the viewer. Firstly, I have to say I do not see coloured auric fields so please don't ask me to interpret your latest aura photo. In fact I have some very firm views on the legitimacy of some aura imaging devices, but that's another story. If a person can see your aura they are usually perceiving a small frequency range within a very complex energy field. Just as I can see blockages within the biofield, it's only within a particular range of frequencies. I say this because I've come to realise that the biofield of any one person is a universe within itself. It would be very arrogant to view one small aspect of that universe and declare to know all there is. Nevertheless, reading someone's aura or energy field is a legitimate tool in helping to understand a person's make-up or state of health at a particular point in time. I hasten to add that I do not consider what I do as medical intuitive. You may understand why, as you read the following information. In terms of energy flow, what I tend to see are shades of grey or black, and sometimes red. Generally the underlying anatomy sort of fades away from view while the blockages within the biofield become more prominent. There's just enough detail to determine what organs may be affected. However, at times specific organs can be highlighted quite definitively. Dark, cloudy energy is sometimes seen up to a metre from the physical body. This dark cloud may taper down into a small point in the physical body, or it may blanket a large area. Hereditary patterns coming down the ancestral line of either the mother or father can also be evident within the energy field, along with indicators of past relationships. Seeing energy fields for me is a combination of looking through my own eyes and also interpreting information coming from other higher sense perceptions. The reader also needs to realise that the Earth displays energy fields too, and they may incorporate portals and vortexes, along with other anomalies in need of re-balancing. That's what I mean about seeing energy fields. I could describe many scenarios, but the point to remember is every person is unique and have their own energy patterns. These patterns form throughout the varying vibratory states, and although we may feel a physical effect in some way, the actual cause or imbalance could be on some other plane. A representation of what is commonly perceived can be downloaded here in Adobe.pdf. Red energy is what I call inflamed energy and I class it as reactive energy. It is reacting to some form of stress whether it be emotional, mental, or physical. Physical stress can be induced by chemicals or toxins for example. Stress from an epidural for example, may show up as red energy flowing down the spine from the site of the injection. Red energy in the area of the head is often an indicator of headaches. Yes we feel physical pain, but the cause of that effect is stress in some form. This is where it can get a little complicated. Sometimes this red energy is confined to just the left or right side. I describe it as inflamed energy just like you might get a red inflamed limb from an injury or infection. It is the body's reaction to some irritation. What's the difference between red and black energy? Red energy tends to be more reactive and flowing while black energy sits like a stagnant lump. I believe that a black energy blockage was once red and reactive before slowing down to form a chronic condition, but this is a generalisation. When performing distant work I like to get a full sized holographic image of the person and view their biofield. Other times I may close my eyes and get a smaller image in my minds eye. Everyone does this. If I asked you to close your eyes and bring up an image of someone you know, what do you see? It's the same thing except I also get to see the energy flow. With regards to Discovery Sessions, I understand that what I report does not always make sense to the recipient. The key to remember is that the imbalances in your energy field may occur long before they are totally evident in the physical body. So sometimes we are perceiving imbalances before their effect is felt. Conversely, and most commonly, we see imbalances remaining long after the physical effects have receded. This can be due medications masking the symptoms but not treating the cause. It can also be due to sensory adaptation where an imbalance becomes normal or accepted over time. Read the article Out of sight, Out of mind. If the imbalance is on the emotional or mental planes then the physical effects could be many and varied. Meanwhile, you may be taking medication to relieve a physical symptom when the cause is on a different level. This is where it can get a little complicated. As an example, cloudy energy above the crown of the head can be an indicator to a number of conditions. These can be anything from fuzzy thinking, to chronic fatigue and even depression in all it's different forms, including post natal depression. It's not for me to diagnose a condition. And of course simply seeing energy fields is just the beginning. Knowing how to correct an imbalance in the biofield is another story in itself. The human energy field is far more complicated than anyone can imagine. Your field connects you to all that is. So along with imbalances in the flow, there can be tell-tale signs of past relationships, genetic hereditary imbalances and cycles, along with inter-dimensional interferences. Glyphs or symbols and platonic solids are also sometimes evident in the outer energy fields. In fact I've already stated that your energy field is a universe within itself. I do not claim to get it right every time. Occasionally there is a crossover of energy patterns between family members and even partners to a lesser extent, especially if there is a significant co-dependency. If you feel I'm way off the mark, I'm happy to revisit your reading. No I am not seeing energy fields everywhere I go. I can walk through large crowds and be blissfully unaware of what is happening for the people. It's none of my business, plus I do not have permission. Occasionally I will meet a person and be shown something significant. Then I have to decide whether it is appropriate to tell them what I am perceiving. Often it will be something different for me, so I get to recognise it as part of my learning, which is always fun. As I have said, I do not claim to be medical intuitive. People often approach me and expect me to see whatever ailment that has been diagnosed for them. It doesn't quite work that way. To begin with, I'm not shown every organ in the body. I am shown the priority energy patterns that need attention. Sometimes it is possible to tell that a particular organ is not happy due to the nature of the energy flow around it. Most often these patterns reflect or can be connected to a particular known ailment, but not always. Although we feel the physical effect, the ailing organ is not always the cause of the problem. The question we need to ask is why does the energy flow to it, or through it, falter? As well as seeing energy fields during a healing session, I also see visitors that join us from time to time. These visitors can be family members in spirit form or healing entities specifically there for the client. Sometimes I can describe their details and sometimes they are just energy forms. This ability is not unique to me. I have no control over it, except that I take steps to only allow in helpers with good intent. Can I teach you to see? Not exactly, but I believe every person is capable of sensing energy fields in some form. Everyone is unique and perceives things in their own way through a combination of seeing, feeling and hearing. I can help you to connect to your Guides to interpret how and what you are perceiving. Most people already "see" at some level even if it's just a picture in the mind, but we tend to dismiss it as imagination. In my training's everyone comes to realise their connection with the energy, whether it is simply feeling the vibration or a combination of some feeling and sight. From there it is simply a matter of practice to develop your skills. When it comes down to it, seeing is just one aspect. I understand that currently there are modalities that would say everything I have just described is totally unnecessary. All you need to do is stand back and channel cosmic energy, or ultra-cosmic energy, whatever that is. There is no need to touch or even speak to the client and no point in seeing energy fields. What can I say? I do what I do. Yes I agree that it's the energy you channel that induces the healing. All modalities have a role to play, but true skill is when a therapist can combine different frequencies to achieve a particular effect, at a particular point. Because every person is unique and at different points in their journey, they will be attracted to different modalities. Everything is evolving and what I'm doing now will be different tomorrow. The key is to stay open to whatever is presented to you. 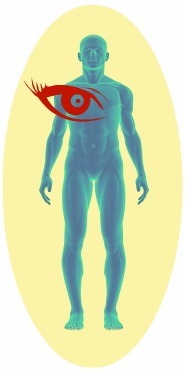 Human Biofield * Article - Out of sight, Out of mind.